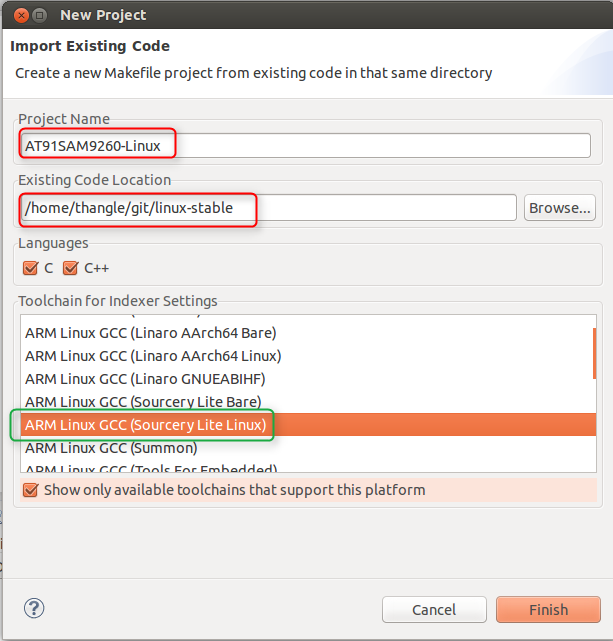 - In Eclipse, select File -> New -> Makefile Project with Existing Code. Browse to the linux-stable directory you prepared above for the Existing Code Location. 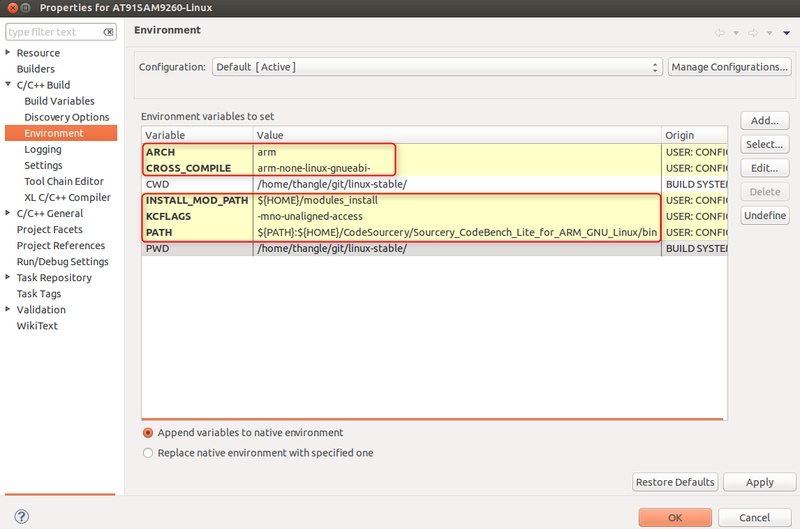 Project name is AT91SAM9260-Linux as figure below. - Modify the build properties for this project. - Select Projects > properties. - Select the Behavior tab. 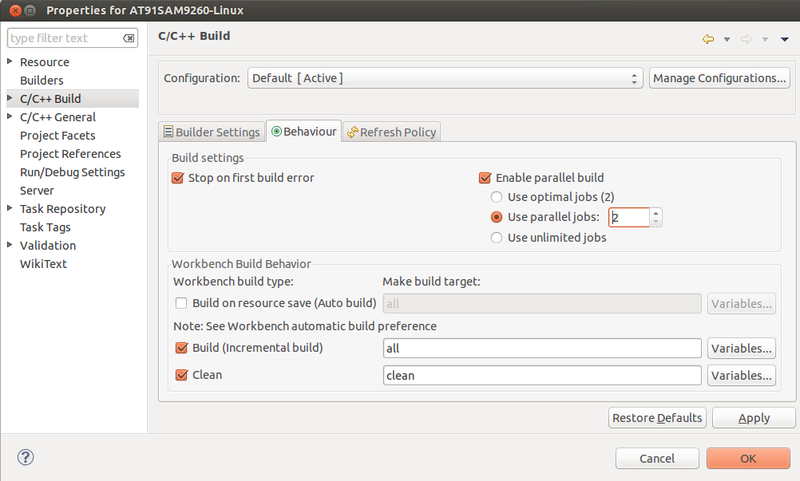 Select the Use Parallel Build option. Enter the number of parallel jobs to run (equal with number of CPU cores in your host PC). Selects C/C++ Build->Environment and adds four environment variables as below. Next, we will consecutively create six makefile targets as follow. - Go to Project > Make Target > Create. 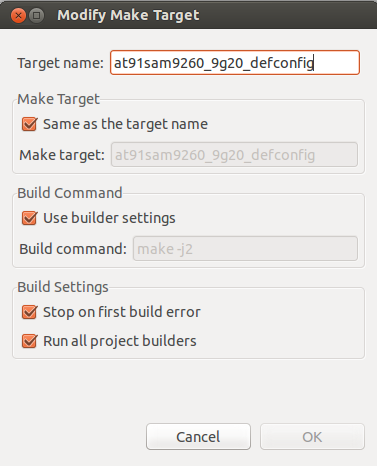 In box Target name, fill name of the make target: at91sam9260_9g20_defconfig. Then press OK to complete as the figure below. Repeats above steps again for the other targets uImage, dtbs, clean, modules, modules_install. As result, we will have six Make Targets as the figure below. a. Runs the make target at91sam9260_9g20_defconfig by double-click on its name. A new .config file will be created in root directory after running this make target. There needs only to run the make target at91sam9260_9g20_defconfig once. We will need only run it again once having any updating in the default configuration file (/AT91SAM9260-Linux/arch/arm/configs/at91sam9260_9g20_defconfig). b. Run the make target clean to clean the previous build. c. Run the make target uImage to compile and generate the kernel image. 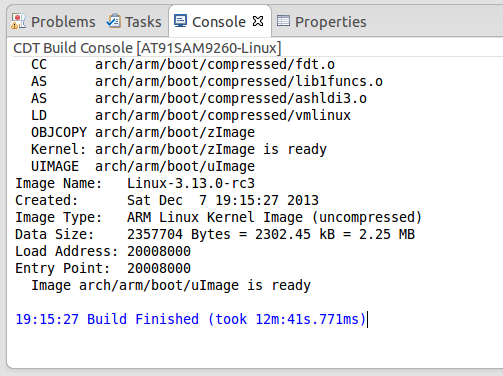 This steps will consecutively create the files Image (uncompressed image), zImage (compressed image) and uImage (compressed image compatible with u-boot) in directory /AT91SAM9260-Linux/arch/arm/boot. The other make targets will be used to build the loadable module and deploy them.